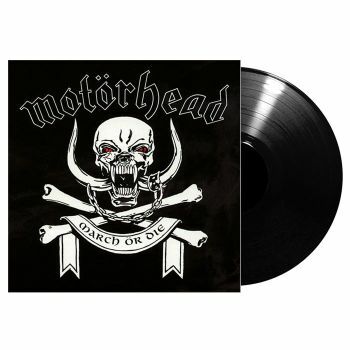 MOTORHEAD - MARCH OR DIE VINYL (LP BLACK) | Online Shop | Wizard LTD. Album: "MARCH OR DIE VINYL (LP BLACK)"
March Or Die is an album by the British heavy metal band Motorhead. It was recorded and released in 1992. Recorded at Music Grinder Studios, Los Angeles, three drummers participated in the making of this album: Phil Taylor, who was fired after "I Ain&apos;t No Nice Guy" was recorded (because he didn&apos;t learn his drum tracks), Tommy Aldridge who recorded most of the material on this album on a sessional basis only, and Mikkey Dee, who recorded "Hellraiser" (which was originally written by Lemmy for Ozzy Osbourne&apos;s No More Tears album). Although it was a major label release, some fans consider the album to be a mediocre recording on the part of the band, especially compared to their previous release and albums before it. Phil "Philthy Animal" Taylor - drums on "I Ain&apos;t No Nice Guy"
Mikkey Dee - drums on "Hellraiser"
Slash - guitar solo on "I Ain&apos;t No Nice Guy" and additional guitar on "You Better Run"
Ozzy Osbourne - additional vocals on "I Ain&apos;t No Nice Guy"